Managing Director, Crosbie & Company Inc.
Colin Walker is a Managing Director of Crosbie with over 30 years of experience in investment banking, corporate banking and capital markets. 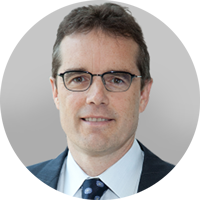 Since joining Crosbie in 1991, he has played leading roles in numerous M&A, corporate finance and succession related transactions, and has also provided advice to the Boards of Directors and shareholders of a diverse range of mid-market and corporate clients. Additionally, he managed the firm’s initiative as Investment Advisor and Portfolio Manager to First Ontario Fund and has been a director of a number of public and private companies. Prior to Crosbie, he had corporate and commercial banking positions at UBS Canada and Continental Illinois. He holds a Bachelor of Chemical Engineering & Management degree from McMaster University and an MBA from the Michael G. DeGroote School of Business. He holds a Bachelor of Chemical Engineering & Management degree from McMaster University and an MBA from the Michael G. DeGroote School of Business.